Commercial Altimeters or Altimeter/Accelerometers are probably the most widely flown pieces of avionics on High Power and Amateur rockets. They range in complexity from those which just beep or flash out the peak altitude reached by a rocket, to more advanced units which record the entire flight altitude and acceleration, fire a second stage, deploy a drogue parachute and deploy a main parachute at a lower altitude, and can then be connected to computers such as PCs and PalmPilots. Generally, altimeters and altimeter/accelerometer combinations are sized to fit in standard High Power Rocketry airframe tube diameters. Most fit in 38mm diameter tubes, some only fit in 54mm diameter tubes, and others are capable of fitting in airframe tubes as small as 29mm, 24mm and even 18mm diameter. A comparison chart of the commercially available altimeters, shows the various features of the altimeters and altimeter/accelerometers. Additional pages are available on both the R-DAS and the G-Wiz LC/LC Deluxe Altimeter/Accelerometer. One area where UK rocketeers seem to be particularly strong is in rocketry avionics. Given the small size of the U.K. rocketry community compared with the U.S. rocketry community, it is interesting to note the high overall usage of altimeters/accelerometers in the U.K. with over 100 units known to be in circulation in the U.K. rocketry community. Additionally a number of people have bought avionics units directly from the U.S. including units such as the IAX-96, the Olsen FCP-M2, the PML Co-Pilot and the Transolve units. In terms of popularity, the G-Wiz LC Deluxe units seem to be the most popular amongst the peak recording units, with the R-DAS units (Compact and Classic) being the most popular amongst the full recording units. I currently use an R-DAS Compact flight computer paired with a G-Wiz LC Deluxe altimeter/accelerometer for redundancy in my rockets which are 54mm diameter or larger, and a Perfectflite MiniAlt and Perfectflite Alt15K altimeter in my rockets which are less than 54mm diameter. Understandably, some may say my collection fo altimeters is excessive, however, my justification is, that I am moving towards a redundant altimeter approach wherever possible, both for recovery system deployment redundancy, and for altitude logging redundancy. Also, the collection has been built up over the best part of a decade too. 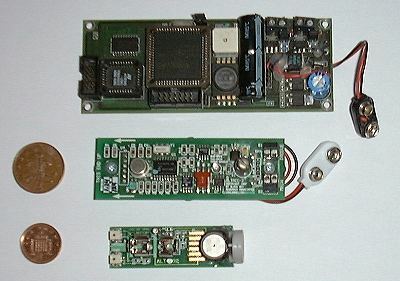 The R-DAS Classic and R-DAS Compact flight computers, manufactured by AED in the Netherlands, are undoubtedly the best altitude logging avionics available in amateur/high power rocketry, due to their flexibility and power compared with the other units. They can be plugged into a laptop computer running Windows, a Palm handheld or a Windows CE handheld, and a software port is underway to Linux, added to that, is the fact that numerous expansion modules are available for them, such as; a GPS module, a telemetry module, a magnetic field apogee sensor and an X-Y acceleration/temperature module. I used to make more use of the ALTACC, manufactured by Black Sky Research of California. It records data for the full flight, and interfaces to both PCs running Windows and DOS and the Palm handheld. The latest version of the ALTACC fits in a 38mm diameter tube, although the previous one didn't - hence the fact that I broke it when I tried to modify it to fit in a 38mm diameter tube (an expensive mistake). As of 2000, it was returned to service, and I have flown it since on several occasions - unfortunately it doesn't download the altitude data though, so is only useful as a backup recovery device now. For smaller high power rockets, minimum diameter altitude rockets and model rockets, I used to use a G-Wiz LC Deluxe peak altitude altimeter/accelerometer. This is a very nice piece of altitude logging avionics - it's a pity I managed to bury it 4 feet underground after a recovery failure. Although I now have another G-Wiz LC Deluxe altimeter/accelerometer, I now use the Perfectflite altimeters, since they are small enough to fit 2 of them easily in small diameter airframes. 3 of my altimeters. From top to bottom: Classic R-DAS, ALTACC, Perfectflite. All 3 of them are recording altimeters, and all 3 of them have 2 output channels, as well as sockets to allow them to be connected to PCs and PDAs via an RS-232 serial port. As can be seen, the Perfectflite altimeter really is a miniscule altimeter. Another popular choice of altimeter/accelerometer (well at least amongst members of MARS) is the Cambridge Instruments IAX-96. This provides even more functionality than the ALTACC that I use. The reason I don't have one is (a) it is more expensive than the R-DAS, the ALTACC and the G-Wiz LC Deluxe, and (b) I have seen a fair few of them experience problems with their complicated wiring harnesses (something the R-DAS, ALTACC or G-Wiz LC Deluxe don't suffer from).